As the economic crisis has spread from financial markets to real economies in countries around the world, governments have understandably focused on short-term measures to contain the damage. Crafting stimulus packages and financial bailouts to address immediate problems has for many reasons been a priority for policymakers. In this Council Special Report, however, Steven Dunaway argues that policymakers must go beyond these steps and tackle one of the root causes of today’s crisis: imbalances between savings and investment in major countries. The report analyzes the nature of these imbalances, which occur when some countries, such as the United States, run large current account (essentially trade) deficits while others, such as China, maintain large surpluses. Dunaway identifies three features of the international financial system that have allowed the imbalances to persist, features that involve both floating and managed exchange rates as well as the issuance of reserve assets. In particular, he notes that the United States’ status as an issuer of such assets has enabled it to finance a current account deficit. The report then prescribes a variety of steps to address global imbalances. Beyond stimulus packages around the world, it urges measures to raise savings (principally government savings) in the United States, reform labor and product markets in Europe and Japan to increase competition and flexibility, and boost domestic consumption in China. Finally, the report advocates improving International Monetary Fund (IMF) surveillance of member states’ economic policies by reducing the role of the Fund’s executive board and depoliticizing the selection of its senior management. Global Imbalances and the Financial Crisis is a timely work that offers thoughtful analysis and recommendations. It makes an important and sober case that without action to deal with global imbalances, these imbalances will balloon again and imperil future economic growth. 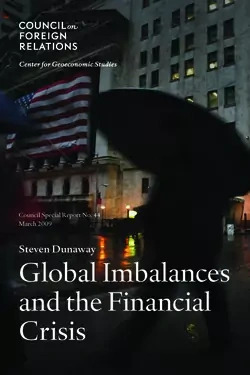 And while such institutions as the IMF and the Group of 20 (G20) have significant roles to play, Dunaway contends that the ultimate responsibility for tackling imbalances rests with national governments. The central question is whether governments are up to this challenge. Download the Arabic translation of this report [PDF].